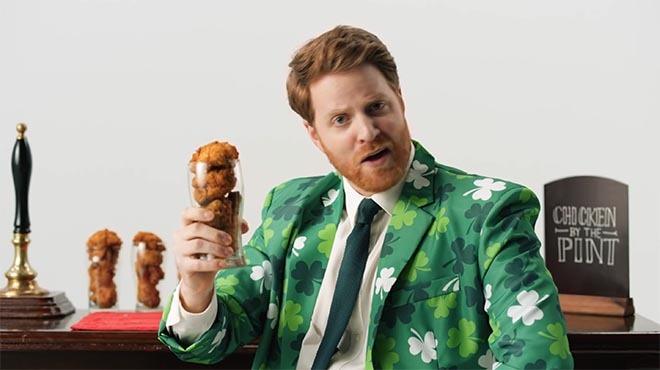 KFC UK and Ireland is marking St Patrick’s Day with the promotion of their 100% Irish O’Sanders Feast bucket. The O’Sander’s Feast includes 14 pieces of 100% Irish chicken, four servings of mashed potato, two sides, eight onion rings and a 1.5 litre bottle of soft drink. The bucket is available in Ireland until 23 April. The KFC Irish chicken in the KFC O’Sanders Feast is 100% Irish. But 100% Irish just ain’t enough for American marketing man Randy O’Brien. To make the feast 200% more Irish he delves into as many Irish stereotypes as he can find. The KFC Irish Chicken campaign was developed at BBH London by creative director Hamish Pinnell, creatives Alex King and Andrew Jordan, agency producer Sarah Cooper, working with KFC marketing executive Nahn Van Wyk and senior marketing manager Lucy Cousins and social media manager Josh Benge. Post production was done at Mini Mill.